To excite the public and interest potential dealers, the design team created a traveling exhibit for prospective sellers to appear at six regional conference centers. A “road show” semi-trailer was assembled to display Smart at concerts, festivals and sporting events in over 50 cities. Lastly, a 3,000 sq. ft. branded dealership brings the brand to life as a retrofit, dual or stand-alone facility. This three-prong strategy resulted in a great deal of press coverage, attracted thousands of buyer reservations and generated a good deal of excitement. Penske’s goal was to sign up 60 dealerships to open in 2008 — he received applications for 1,200. 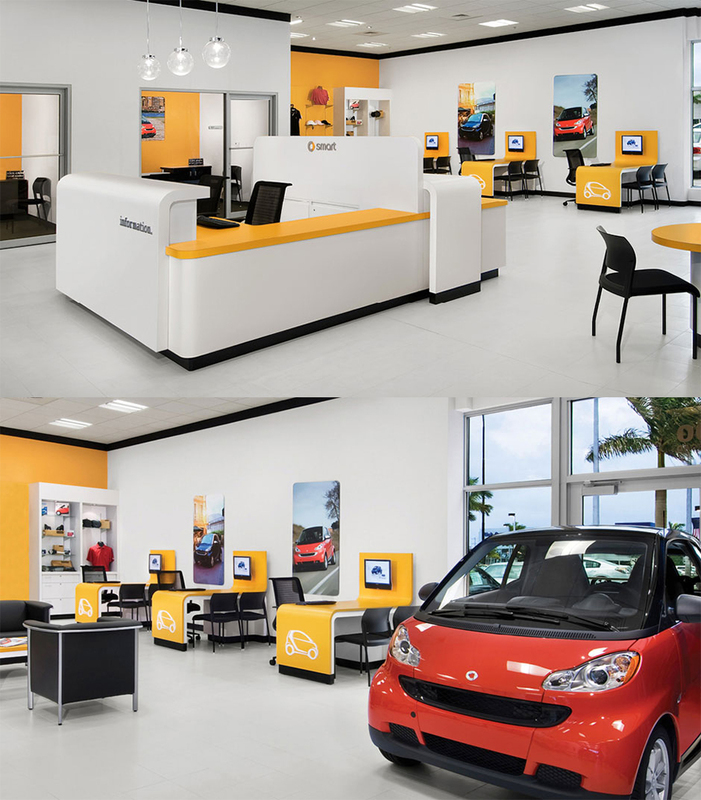 Initial ideation of SmartCar US was a multi pronged effort which included a branded experience for exterior dealership designs to roadshow introductions to possible dealers to branded interior fixtures and brand accessories. The final prototype for SmartCar US was rolled out throughout the country in both ground up and retrofit applications. The system included multiple ways that the parts and pieces of the interior and exterior could be arranged to accomodate for the level of square footage each dealer wished to apply to SmartCar.